Haven't put out a CD in a while but I did collect a few of my favs from the last two years. Hoping for the best as usual. Whatever happens it's good to reconnect with old friends and co-conspirators. I'm open to learning so critiques are always welcome. For my actual resumé go to http://www.GuitarSlinger.com and click on "Bio". Thanks for updating me he comments thread and for your comments about Raining Underwear. I’ll take a look at the length of the chorus. Thanks for listening and your kind comments! Much appreciated! That sounds great! I just love our song. Makes ms smile. A little late responding, but thank you for your wonderful comments on my Meta FAWM song Club Midnight! You are something. Add to that your impressive output of wonderful new material this year. Huge congrats JW! Thanks. Can you maintain the century club from here? I have set the Google spreadsheet to world editable, so you're welcome to use it if it helps. I was glad to help out. The century club is a great motivator for me, and a great way to discover new active Fawmers. Thank you for your kind comments on "I Will Eat Anything". I really appreciate the feedback! Thanks also for replying back to my question in the comments section of "Just A Minor Blues"!! 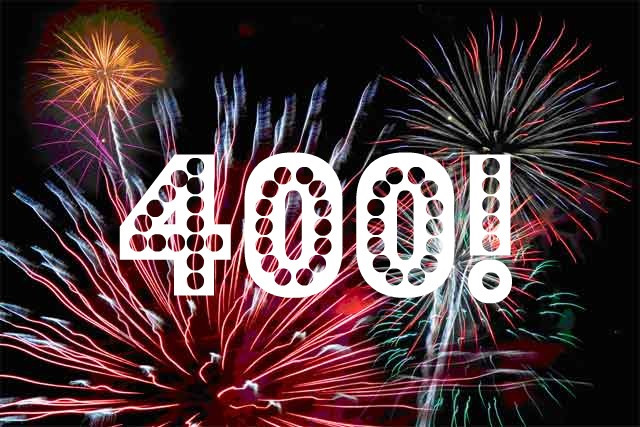 Congratulations on 400 comments!! That is a lot of giving!! A lot of listening and you posted 30 songs! Fantastic. Thanks for listening and commenting on "The Man in the Next Room". Regarding Snow on the Rooftops of Prague -- Paul Henry already wrote a waltz for that lyric. The other musician has asked to do her own music but that won't come until April. Congratulations on so many songs and thanks for keeping tracking of the commenters who break 100 and beyond! Sure! Guitar will be good too! Hi John, the first thing on your song that reminded me of Randy Newman is the similarity in vocals, but after going back and having another listen, even before the vocal kick in, the music reminds me of that "happy" sound that Randy likes to use... not sure how else to describe it, but it works fantastically. I greatly appreciate your comment on my song Balsamic Moon. I greatly appreciate your suggestions! I will look into them once I start revising the song. Thank you for your comment on "Journeyman." I did just listen to Laurie Anderson's Homeland the other day, so that was definitely an influence. Thanks for my 200 banner! JW, "The Old Soft Shoe" is way beyond my expectations and as usual, you put it there. Thanks. email me the final rendition so I can post it on my Reverb page. lwj001@hotmail.com You have almost a whole album now. I can't believe in 400+ comments I haven't listened to any of your fawm yet. Gimmee an hour. Even in my neglect, I still think you rock. Thanks for your second message on my soundboard. I really appreciate what you said. I really think that FAWM is a way for us all to to connect with and learn from each other. Thx for your skirmish comments. Im travelling around australia and then elsewhere until early June. So apart from a couple i pre recorded in early feb no.music for few months. 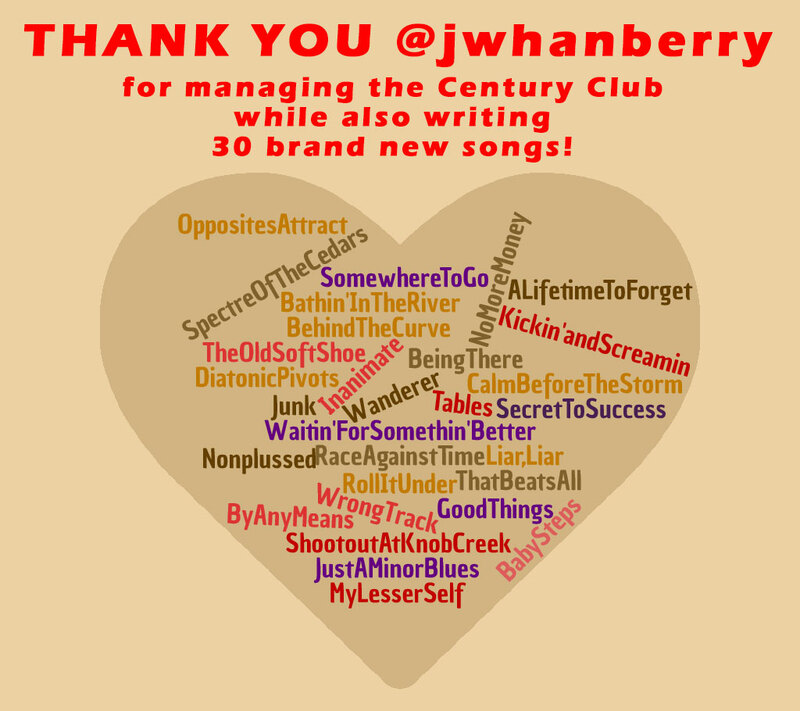 Thanks for the century club shout out! It is the first FAWM where I have posted so many comments on songs. Thanks for the century club shout out! Thanks for the comment and precise observations on "Hearts Ablaze"! Hey there, I wanted to pop in and let you know that I got a demo up for my song Ghosted that you had commented on. Let me know what you think. https://fawm.org/songs/90470/ Thanks. Thanks, that made me feel special! Thanks for your comments and suggestions on “Who Let the Dogs Out.” I like your ideas for the last verse! Hey, thanx for the giant pink 200 on my Soundboard. It has brightened up my day! John, many thank you's for recording A Lifetime To Forget. Thank you for your kindness on Cosmic Osmosis. And thank you for the 100 & 200 comment award posters! I've only ever gotten to 100 in years past. Seems I'm ready to smash my record this year. Thanks for the support! Thanks for your kind words about my car-girl song. Funny where the muse leads us sometime. It's a simple little song but I really enjoy it. Thanks for my badge of honor at 100. 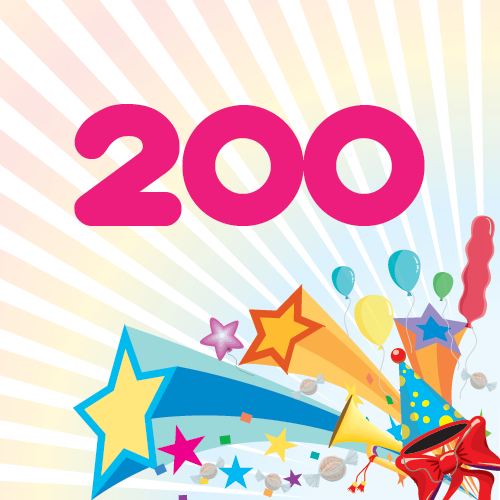 Going for 200 now - you'll be keeping busy keeping up with us all! Thanks for tracking us and the celebratory graphic! 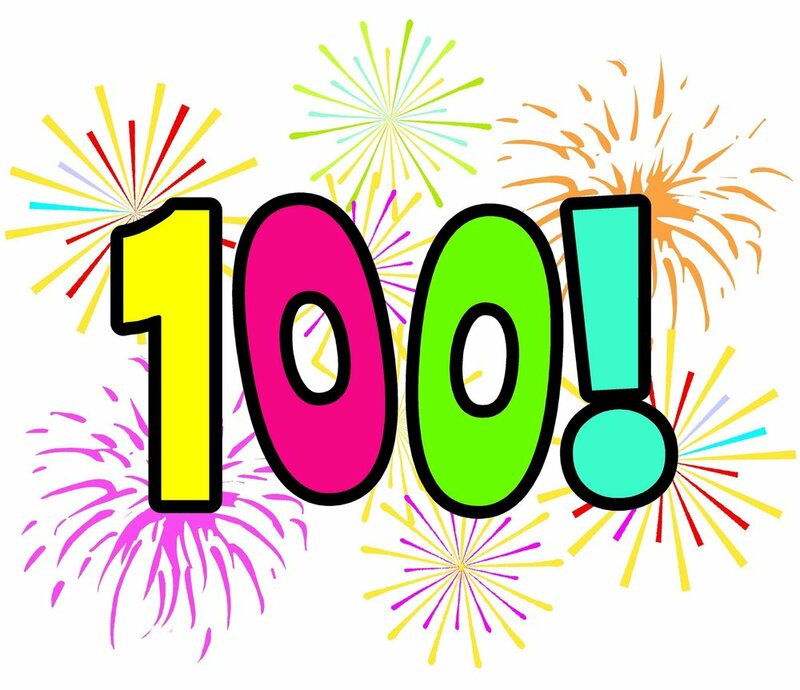 Thanks for the nice 100 comments image! And thanks for the century post managing again.. Have a happy fawm! Thanks JW! 😀 Yes, exactly what i was trying to say. ha! you may be right about a certain person being a horrible at telling a lie! 😀 thanks for listening! Hi there, have a happy fawm. Thanks for starting the century club thread on the forum. John, thanks for working on some of my lyrics. You always do a fine job. Thanks for your comments on Don't Go Far." I can see how the hanging verse goes in a different direction. What I wanted to convey was how different people in our past, good people or bad people may have influenced us. So the hanging was meant to be someone who made bad choices but may not have regretted them. Thank you so much for your comments on my skirmish song, Storm Warnings. I'm working hard to learn how to create metaphors so especially appreciated your positive comment about that! Thank you for your comments, and want to say your stuff is so cool. Amazing output, and so groovy! Hey, my friend! Lots of new equipment, and new experiences, so I'm hoping to do a lot more this year. Hoping that I will be more active than I was last year. Thanks for saying hi! Thank you for the welcome, and it’s great to see you back as well. Here’s to a successful (and fun) FAWM! Thanks for the greeting. Looking forward to enjoying some of your work again! Happy FAWM! Perhaps we can work up an old duffers song together. Combined age of 153. Lots of living has taken place. Should be able to come up with something. Let's have a good one! Hi JW. It's definitely going to be a "whatever happens". As I'm snarled in old sewing machines right now, how about a Singerslinger song? Hi back to you! Influences all over the place like me, I see - I dig that! Thx mate have a great one! Hello!!! Looking forward to hearing your music and hoping you might be interested in some lyrics! Have an awesome FAWM! Looking forward to the madness! So good to see you here again this year. It's great having this group to make music with and to celebrate the love of song.